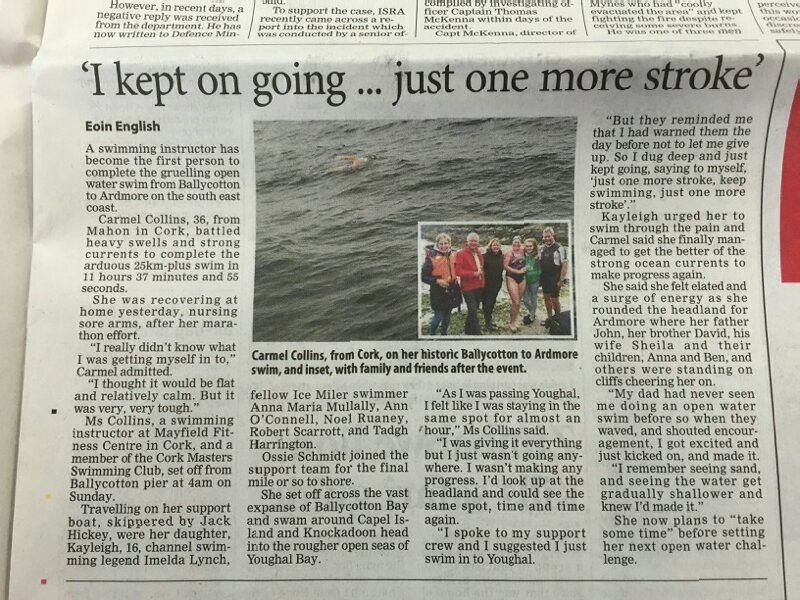 Carmel Collins completed the first ever swim from Ballycotton to Ardmore (Cork to Waterford) last weekend. She plans to put a complete account of the swim on her blog, but has done a summary here of the great swim. Very well done from everyone in Myrtleville. I had my eye on that swim for a few years now, but originally I wanted to go to Youghal. After the Myrtleville to Monkstown swim this year, I started planning it and so I thought, “Why not make it longer?” . The distance is 25km as the crow flies but I ended up swimming 27km in 11.37.55. When we were bringing the stuff aboard there was a funny moment when I picked up a basket which I thought was the Jacobs Cradle. I said to Imelda, “How in the name of God will I fit in that?” After she laughed her heart out, she then informed me it was a lobster basket – LOL! After months of planning and the last few windows falling through, it finally came. The start was 4 am on Sunday the 23rd at Ballycotton pier. I was very excited. My crew members were my daughter Kayleigh Collins, Imelda Lynch, Annamaria Mullally,Tadhg Harrington,Skipper Jack Hickey, Ann O’ Connell, Noel Ruaney and Robert Scarrott with Ossi Schmidt. I was very relaxed and happy before the swim – I was in great form. When I got onto the boat and when I was getting greased up my legs got a little shakey. Nerves kicked in and I got a little worried for a moment . There was a slight wind there. After getting greased I made my way off the boat and over to the start which was a ladder at the side of the pier. I got down very slowly. Every step was nerve racking in the pitch black. I said to myself, “This is it. Just go for it and do your best”. The whistle went and I was off. I wanted to land in Youghal at that stage so my first support swimmer came in for an hour, Tadhg Harrington. I managed to put my head down and with kind but firm words from my crew kept going right until the end . I had trained for this in Myrtleville and Sandycove. I did the Myrtleville to Monkstown swim, then trained away. Then I did the Distance camp and I completed a 6 hour at the end of it . I also did a little triathlon training – so it was a bit of cross training. Most of my swim training was done in the sea. Irish Examiner Report on Carmel’s Swim. 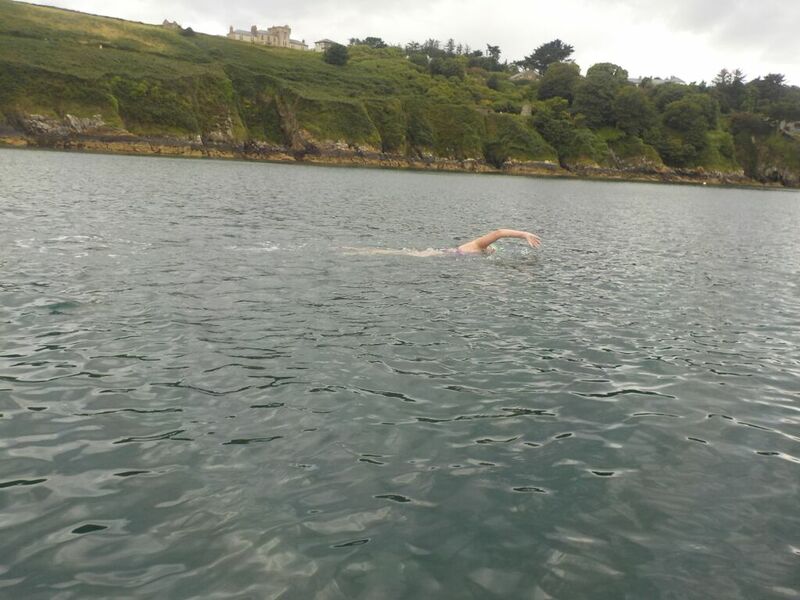 This entry was posted in Information and tagged Marathon Swimming, Open water swimming - Cork, Open water swimming - Cork - Ireland, Sea swimming - Cork, Sea Swimming - Cork - Ireland by myrtlevilleswimmers. Bookmark the permalink.